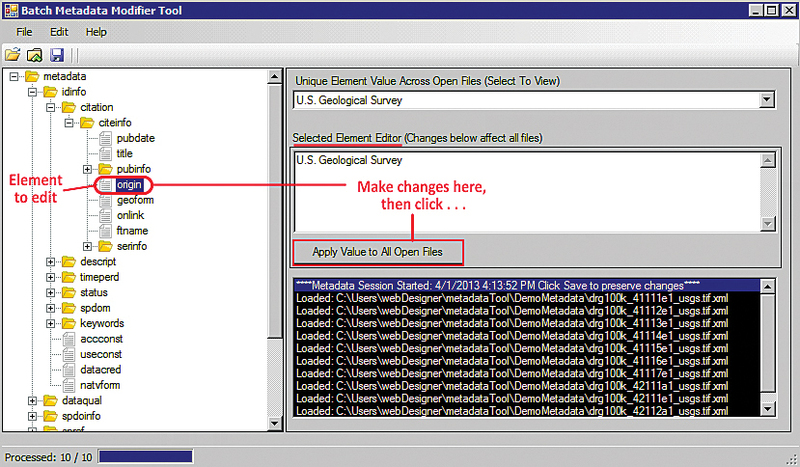 Maintaining metadata for many ArcGIS items can be a daunting task. The University of Idaho Library developed an ArcGIS Add-In that makes this task much simpler. The out-of-the-box graphical user interface metadata tools in ArcCatalog 10.x are designed primarily to allow users to interact with metadata one item at a time. Although ArcCatalog offers a limited number of tools for performing metadata operations on multiple items, there is a need for more efficient and effective tools. The ability to efficiently modify the content of multiple items iteratively is not just desirable, it is necessary. Editing metadata for many ArcGIS items can be accomplished using other approaches such as XSLT and Python. However, a method that requires scripting is not always user-friendly. A tool with a graphical user interface is, in many cases, simpler and more efficient. The Batch Metadata Modifier Toolbar is a step in that direction. 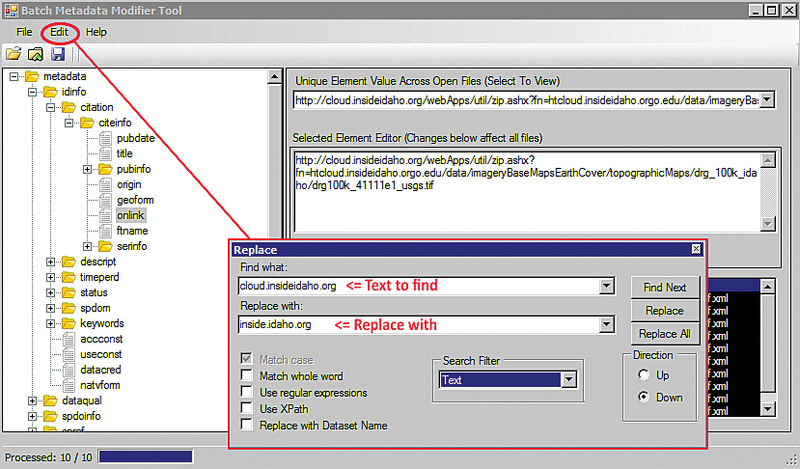 The toolbar, which is available as an ArcGIS Add-In, currently contains two tools, Batch Metadata Modifier Tool and the Batch Metadata Thumbnail Creator Tool. The Batch Metadata Modifier Tool, which is also available as a stand-alone Windows executable application, allows users to iteratively update metadata on multiple items. The Batch Metadata Thumbnail Creator Tool enables the batch-creation of the graphic that appears with an item’s metadata to illustrate the item. In the Unique Element Value Across Open Files drop-down menu, the user can edit the value in the window below it and replicate those changes across all similar elements in all open files. Iteration capabilities are imperative when the task at hand involves applying identical updates to large batches of files. The Batch Metadata Modifier Tool is simple to use and eliminates the need to perform protracted, mundane repetitions of identical operations on multiple files individually. A user can open a single file or group of files via the ArcCatalog Contents Tab to modify existing elements, find and replace element content, delete a metadata element, or import metadata elements from external templates. The metadata structure for a file or many files is presented as a hierarchical tree in the left-hand window. The user can navigate through the tree and examine the values of each element, which are listed in the Unique Element Value Across Open Files drop-down menu on the left. The user can edit the value in the window below it, and then, if desired, replicate those changes across all similar elements in all open files. The Batch Thumbnail Creator Tool is similarly simple to use. A user can open a single file or group of files via the ArcCatalog Contents Tab to generate thumbnails. This tool has a lengthy history because since its inception, INSIDE Idaho has operated under the principle that metadata is necessary not only for discovery but also for use and understanding. INSIDE Idaho, the State of Idaho Geospatial Data Clearinghouse operated by the University of Idaho Library, maintains approximately 60,000 metadata records based on three standardized formats: the Content Standard for Digital Geospatial Metadata (CSDGM), the ISO 191** series, and the ArcGIS 1.0 format. Staff also help researchers generate standardized documentation for data products submitted to the INSIDE Idaho repository. INSIDE Idaho originally developed a similar tool in 2004 for the ArcGIS 9.x for Desktop platform. The tool was used extensively by INSIDE Idaho staff to maintain documentation for items in its repository. 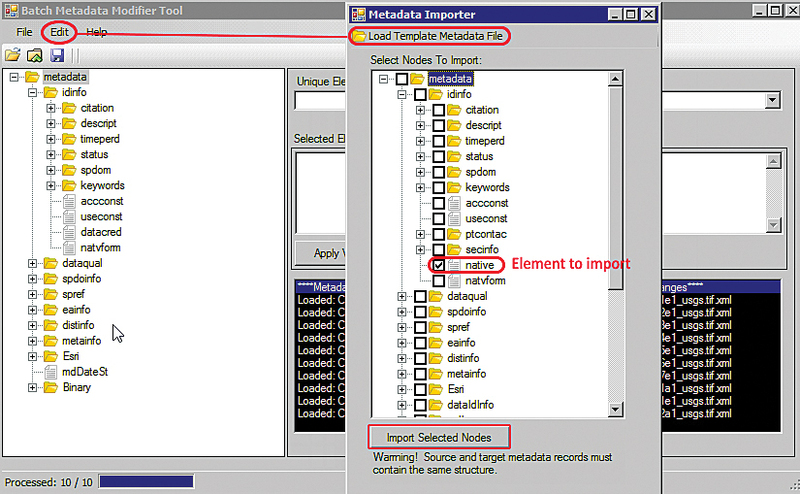 A user can open a single file or group of files to import metadata elements from external templates. The 10.x platform required the creation of a new tool. The resultant multithreaded application, developed in C# using the ArcObjects SDK for .NET, was created by students at the University of Idaho in conjunction with Esri partner Innovate! Inc. 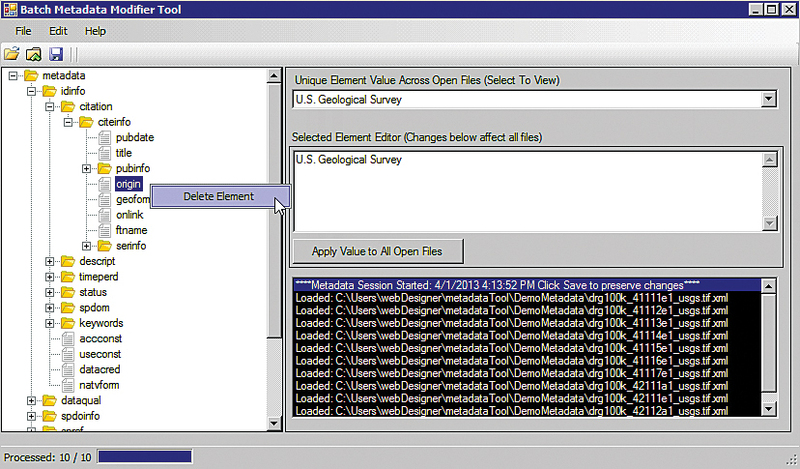 Innovate has extensive experience developing metadata applications, including the EPA Metadata Editor. 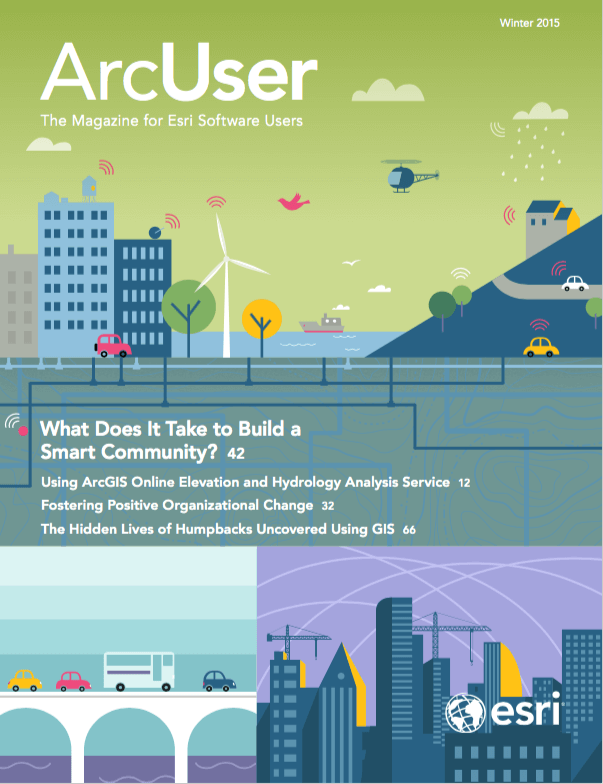 [See “The EPA Metadata Editor” in the July–September 2007 issue of ArcUser.] Initial development of the new tool began in 2011, but due to a lack of funding, the tool was not ready for initial release until 2013. The Batch Metadata Modifier Tool supports scientific research data services. 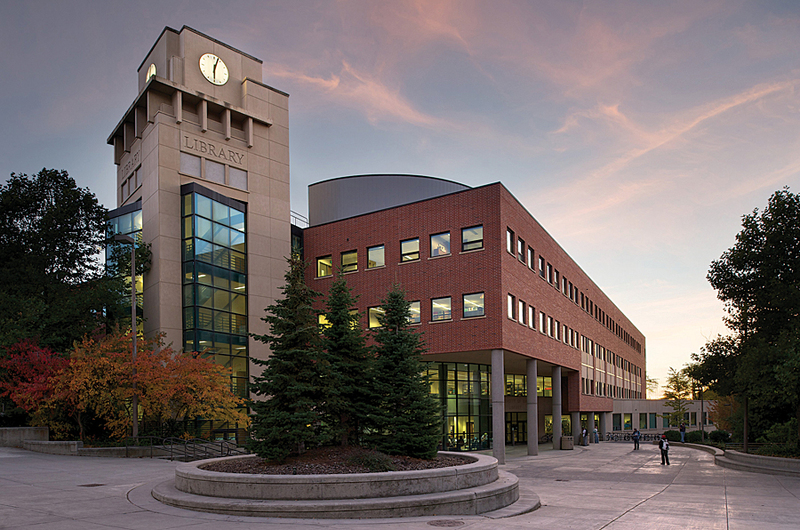 For example, University of Idaho staff support the United States Geological Survey’s National Climate Change and Wildlife Science Center. The metadata records delivered for this project often need small adjustments such as the addition of keywords, improvements to the projection information, or refinements to titles and contact information. It is not uncommon for climate-related data and metadata files to be produced under a series of different climate projections and scenarios, thus requiring multiple similar files. Depending on the research, there may be several dozen or several thousand files. When a change is needed, it must often be propagated across all the files. With the Batch Metadata Modifier Tool, the University of Idaho staff can accomplish this task with ease. The Batch Metadata Modifier Tool can also find and replace element content. While this tool is very useful in its present state, it could benefit from further enhancements. The tool currently does not load the schemas for metadata it modifies. Such an adjustment could be valuable for users, since the schema could then be queried to understand the document’s structure. Additionally, the ability to select objects that exist in multiple locations would be helpful. It would be useful to recursively walk directories and geodatabase feature datasets within ArcCatalog to more efficiently update large collections of items that exist in different locations on the file system or in a geodatabase. This was possible in 9.x utilizing searching and shortcuts, but that functionality was removed in the 10.x platform. This tool is primarily designed to be used by those familiar with metadata, metadata standards, and metadata schemas, particularly those with experience modifying standardized metadata. Users of this tool must fully understand the files they are modifying and are encouraged to make copies of their documentation prior to performing batch modifications. This tool is primarily designed for use by people familiar with metadata, metadata standards, and metadata schemas. The Batch Metadata Modifier Toolbar represents a significant step forward in efficiently managing multiple metadata records. The authors welcome collaboration on further development of this tool. For more information, contact Bruce Godfrey, GIS Librarian, University of Idaho. Go to the INSIDE Idaho website to download this free add-in for ArcGIS. This tool is designed for people who are familiar with XML metadata structures and schemas. It can be run as an ArcGIS Add-In or as a stand-alone Windows executable file. It runs on PC only and is not supported on Mac. The ArcGIS Add-In requires ArcGIS 10.2 for Desktop. Metadata formats accepted: FGDC CSDGM, ArcGIS 1.0, ArcGIS ISO, and ISO 19115. Bruce Godfrey is a GIS librarian at the University of Idaho Library. He is involved in the creation, maintenance, and curation of standardized documentation for geospatial resources. Jeremy Kenyon is a research librarian at the University of Idaho Library. He is involved in the creation, maintenance, and curation of standardized documentation for geospatial resources. Alex Kyrios is a metadata and catalog librarian at the University of Idaho Library. He is involved in the creation, maintenance, and curation of standardized documentation for geospatial resources. Dan Spinosa, geospatial developer at Innovate! Inc., has more than 12 years of project management experience supporting programs at the local and national government levels as well as programs within academia. He has been one of the lead developers for supporting desktop and web-based metadata solutions utilized by the University of Idaho and EPA Environmental Dataset Gateway.